(CNN) -- Prices at the pump have fallen slightly for the first time since December, according to a survey published Sunday. 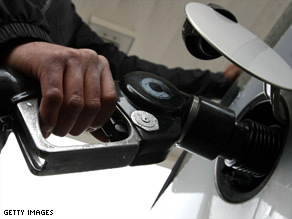 The average price of a gallon of self-serve regular across the U.S. is down a penny to $1.95. The average price of a gallon of self-serve regular is $1.95, down a penny from two weeks ago, the Lundberg Survey found. Prices had been steadily rising since mid-December. But the drop "can't last," said publisher Trilby Lundberg. With crude oil prices on the rise and gasoline demand up, prices are sure to resume their climb, she said. Demand rises in the spring as more people drive, and demand is higher than it was a year ago, largely because gas is still so much cheaper than it was then. The average at this time last year was $3.26 a gallon, $1.31 higher than the current average, Lundberg said. The survey, which tallies prices at thousands of gas stations nationwide, found the lowest average price in Cheyenne, Wyoming, where a gallon of self-serve regular cost $1.67. The highest average was in Honolulu, Hawaii, at $2.36.